STANDARD SQUARE TAIL. This design shape has proved to be very good for beginners to get a quick start into surfing. Easy to catch waves and good control through manoeuvres .These boards will hold their price on the second hand market, making them easy to sell on. Most surfers will keep their mini-mals as they progress on to short boards, and so keep a board for small fun days. SWALLOW-TAIL.This version of the mini mal is designed to be more progressive giving harder,more radical turns due to the harder edges in the tail shape and the rails. PIN-TAIL.This version gives the rider a smoother style of surfing, which is sometimes prefered. All boards can be custom made to suit the individual rider and their requirements,also a variety of standard designs are available. Scroll through the section below to see a variety of boards.Some are in stock others can be made to order. Roger. Description Good for beginners (up to 11 1/2 stone)and a good fun board for regular surfers. Description good for beginners (up to 13 1/2 stone)and regular surfers to use on small days. Description good for beginners(up to 13 1/2 stone)and for regular surfers on small fun days. Dimensions 7ft 6"x 21 3/4"
Description A close relative of the magic carpet concept boards capable of easy nose riding and agressive surfing with tight turns. most suited to accomplished long board riders.This is not a mini mal.These are generally with a polished finish! Dimensions 7ft6x21.75(shown) available 7ft2 to 7ft11. 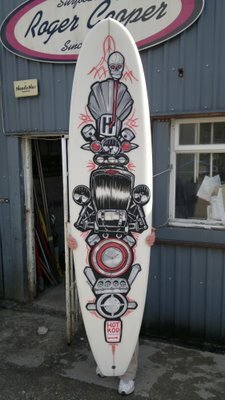 Description This is a high performance mini mal, suitable to ride in conditions up to 8ft, the construction allows for a light weight and tough board.the bottom of this board is full carbon fibre glass(see pic below), with the deck Glassed in Kevlar. Fins are Carbon. colours As Seen.Custom Order only. 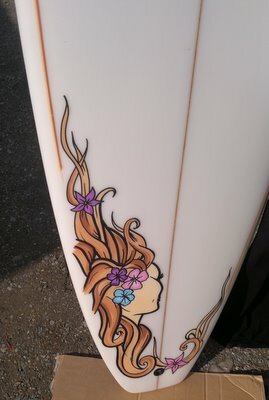 Description This board has been designed for the girl surfer who is already up and riding.with nice floral art.Art by Ralph! Description A good introductory mini mal designed for a surfer girl.. Art by Ralph! Description girly model mini mal.. Art by Ralph! Description classic mini mal shaped a little thinner for girls.. Art by Steve! colours blue deck fade, or to customers own colours! Description A Good beginners board, and classic mini mal for any surfer! Description A Good beginners board, and a classic mini mal for all surfers! colours red middle panel with yellow sides! Description classic mini mal shaped a little thinner for girls..Art by Steve! colours pink or to customers choice! colours pink, or to customers choice! Description Standard mini mal, with very unique graphics!! colours as seen or to customers choice of colours! colours as seen, or to customers own colours! Model: Magic mat, triple stringer. Description A close relative of the magic carpet concept boards capable of easy nose riding and agressive surfing with tight turns. most suited to accomplished long board riders.This is not a mini mal. Poished finish! Description classic mini mal shaped a little thinner for girls. Art by Stass! colours as seen, or customers choice! Description Classic mini mal, shaped a little thinner for girls! Art bu Ralph! Description Classic mini mal. Good learning board! Description Classic mini mal.Good begginers board and a classic mini mal for all surfers! colours Multi coloured over spray! Unique graphics!! Description Large size mini mal.Really good for a beginner over 15 stone! Dimensions 7ft6inches x 21 3/4" or to customers choice..
Dimensions 7ft3"x 21 1/2"or to customers size! Description Girly mini mal to order. Generally we make the girly boards a little thinner! Description Mini mal for Girls.. These are generally shaped a little thinner for girls. Dimensions 7ft6" x 21 3/4"
Dimensions 7ft 6" x 21 3/4"
colours Nice deck design.. Any colour available..
Dimensions 7ft"6" x 21 3/4"
Description Classic mini mal a little smaller for girls to learn and progress on! colours This design or similar to customers own ideas! Description Classic mini mal, shaped by Roger Cooper.. Description Sam with her favourite piece of music. Dimensions Custom order to size. 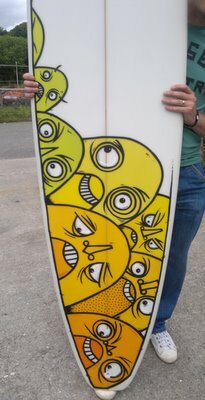 This is 8ft x 22"
Description Mini Mal.. Tara`s custom design, Posca art by Steve.